Custom Champion Legion Award Belt with your personalized artwork. This show stopping belt is perfect for graduation, athletic competitions, top performers, and many other events! 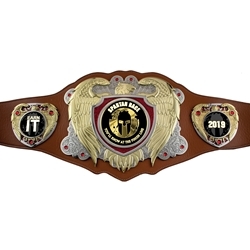 Constructed of brown or black vegan leather, the Legion Championship Award Belt measures 52" long with a 9.5” x 7.5” center plate, featuring a bright dual-plated 3D eagle design and two smaller 3.75" x 3.5" eagle side plates. Silver glitter fill along with clear synthetic stones accentuate the different plates for maximum effect! Each belt comes with three customized Vibraprint™ poly domed emblems and is packaged in a satin-lined presentation box. Add the quantity of belts to the cart by clicking "personalize my award"
We will email you a free proof for approval within 1-2 business days. For best results, provide vector ready artwork (.eps or .ai). Please allow one week of production time after proof approval before this item ships. Rush processing available at additional cost. Contact us for details.